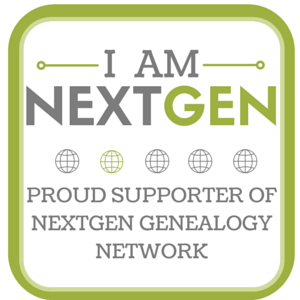 1 “Iowa, Births and Christenings, 1830-1950,” index, FamilySearch (https://familysearch.org : accessed 6 Jan 2014), George Hiram Thoma, 29 September 1880, and 1895 Iowa State Census, Garnavillo, Clayton County, Iowa, Gorge H. Thoma [George H. Thoma]; database, Ancestry.com (http://www.ancestry.com : accessed 6 January 2014), citing State Historical Society of Iowa. 2 Fern (Thoma) Adam, conversation with Brian Adam, August 1984; notes in author’s files. The late Mrs. Adam was the daughter of George Hiram Thoma and stated that George’s father was abusive when he drank. 3 Osceola County, Iowa, marriage of George A. Neilson and Leota Fenton, 23 March 1902; Recorder’s Office, Sibley. 4 Osceola County, Iowa, marriage of George A. Neilson and Leota Fenton, 23 March 1902; affidavits of Mrs. Mathilde Thoma and Leonard C. Thoma; Recorder’s Office, Sibley. 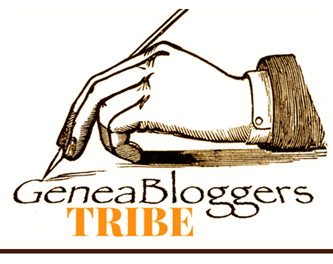 The affidavits were created in the 1940s by George’s mother and brother; by this time, George’s father had passed away. 5 1895 Iowa State Census, Garnavillo, Clayton Co., Iowa, Gorge H. Thoma [George H. Thoma]. 6 “School Reports,” The Graphic (Postville, Iowa), 04 Mar 1897, p. 3, col. 3; digital image, findmypast.com (http://www.findmypast.com : accessed 03 May 2016); citing Newspaper Archive (http://www.newspaperarchive.com). 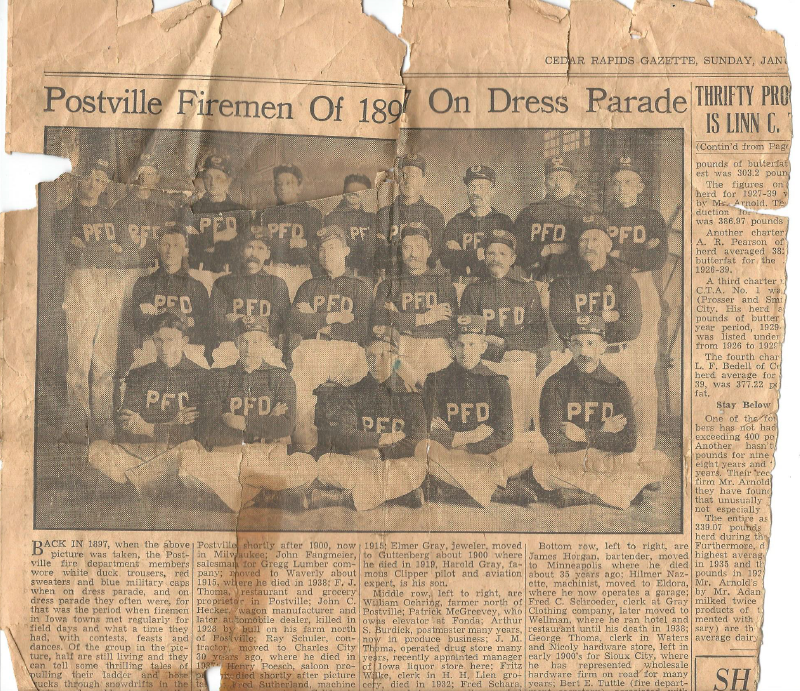 7 “Postville Firemen Of 1897 On Dress Parade,” Cedar Rapids (Iowa) Gazette, 28 January 1940; digital image, findmypast.com (http://www.findmypast.com : accessed 25 July 2016); citing Newspaper Archive (http://www.newspaperarchive.com). 8 “Postville Firemen Of 1898 On Dress Parade,” Cedar Rapids Gazette, 28 Jan 1940. 9 “Postville Happenings,” The Graphic (Postville, Iowa), 20 January 1898, p. 3, col. 1; digital image, findmypast.com (http://www.findmypast.com : accessed 03 May 2016); citing Newspaper Archive (http://www.newspaperarchive.com). 10 “Postville Firemen Of 1898 On Dress Parade,” Cedar Rapids Gazette, 28 Jan 1940. 11 “Postville Review,” The Postville (Iowa) Weekly Review, 15 July 1898, p. 3, col. 5; digital image, findmypast.com (http://www.findmypast.com : accessed 03 May 2016); citing Newspaper Archive (http://www.newspaperarchive.com). 12 “Geo. H. Thoma […],” The Postville (Iowa) Review, 13 January 1899, p. 3, col. 4; digital image, findmypast.com (http://www.findmypast.com : accessed 03 May 2016); citing Newspaper Archive (http://www.newspaperarchive.com). 13Woodbury County, Iowa, “Register of Births, 1907,” entry for Fern Lavaun Neilson, 30 September 1907; Recorder’s Office, Sioux City. 14 “U.S, City Directories, 1821-1989,” database, Ancestry.com (http://www.ancestry.com : accessed 6 January 2014), entry for George A. Neilson; citing “Polk’s Sioux City Directory, 1909 (R.L. Polk & Co., 1908),” 411. 15 George H. Thoma (Rock County) homestead file, case no. 1383, Valentine, Nebraska, Land Office; Serialized Land Entry Case Files That Were Canceled, Relinquished, or Rejected, ca. 1909-ca. 1918; Records of the Bureau of Land Management, Record Group 49; National Archives at Kansas City. 16 “Postville Happenings,” The Graphic (Postville, Iowa), 10 February 1899, p. 3, col. 1; digital image, findmypast.com(http://www.findmypast.com : accessed 03 May 2016); citing Newspaper Archive (http://www.newspaperarchive.com), and Osceola County, Iowa, marriage of George A. Neilson and Leota Fenton, 23 March 1902. 17 “Garnavillo Gleanings,” Clayton County (Iowa) Journal, 15 December 1905, p. 8, col. 1; digital image, A Digital Archive of Guttenberg Public Library (http://www.guttenberg.advantage-preservation.com : accessed 25 January 2015).